Bright, efficient lighting wherever you need it—a great side lighting source for sanding and finishing. 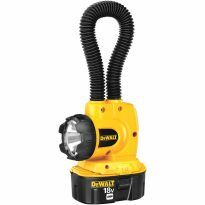 Foldable and freestanding, this convenient work light can go wherever you need it. 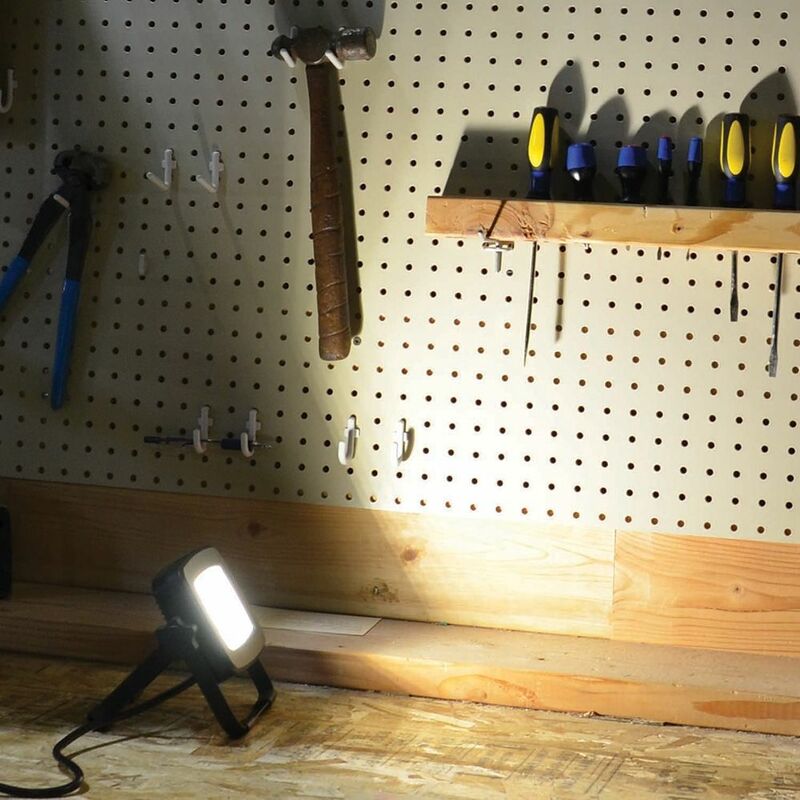 Set up as a side lighting source on the sanding or finishing table to highlight flaws, or use it under a vehicle or inside a cabinet to shed light in dim conditions. The scissor stand folds out for support, and also doubles as a handle. The rugged housing helps to guard it from the bumps and shocks of the jobsite environment. Energy efficient and extremely durable, thanks to an LED life of 50,000 hours. Plug in and press power button on the back of the light. Light weight, well made, bright light. Would buy again. 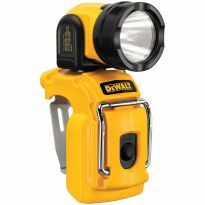 Great little portable bright light especially with a on/off switch vs unplugging it. Great work light. Lite weight and bright. Lots of light from a small source. I used this light to paint a dimly lit room and it was all I needed. This light made it easy to spot places I had missed or needed another hit with the paint roller. I am very pleased with as it's very light, travels easily, and is compact. I'm glad I bought two. Great light for those hard to see corners. Great light weight light that is bright and doesn’t give off any heat like the old halogen ones. 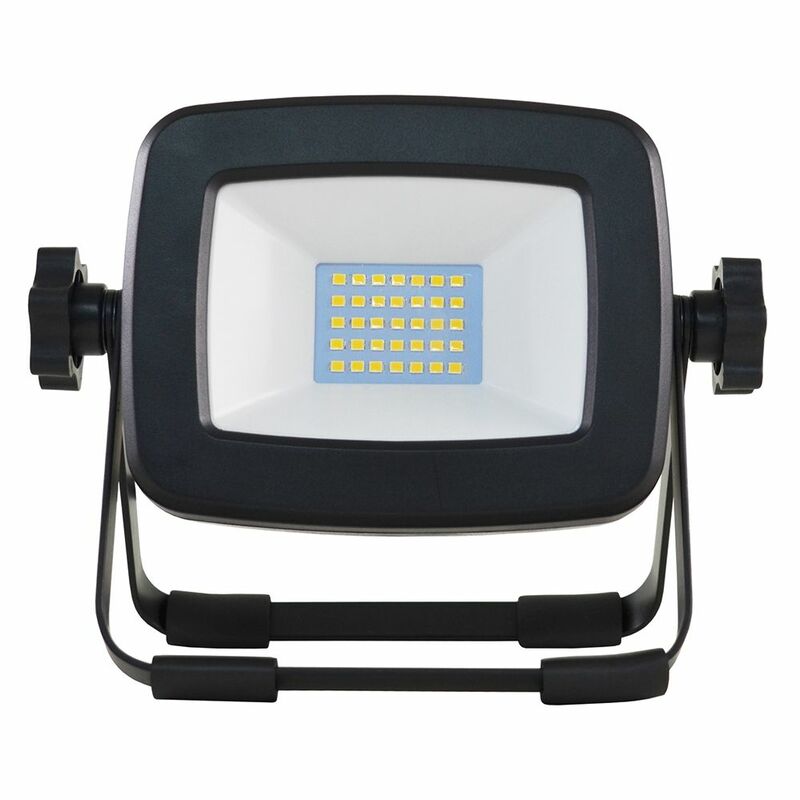 The light is fairy compact and easy to carry and store. I was genuinely surprised at the brightness this little light emits. 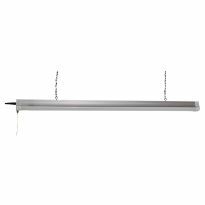 Perfect for dark work areas where you don’t have room to set up the big project lights. I saw this unit on sale when one of my halogen lights blew a bulb. 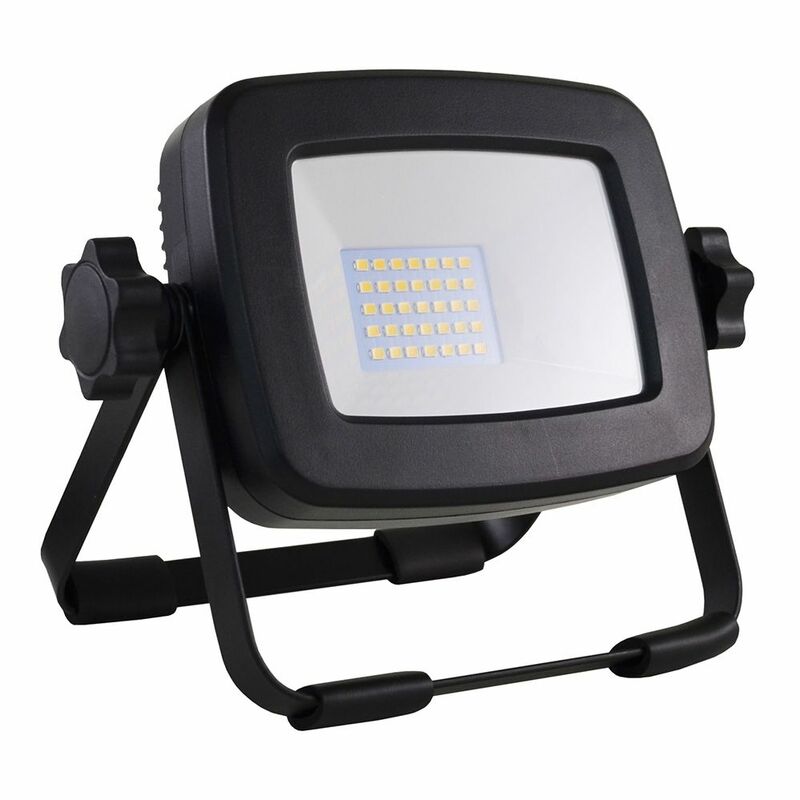 It runs cool; provides fantastic light; and, is very versatile for inside / outside projects. I wish I had purchased two, and will probably buy another in the near future. I feel very comfortable if I leave this unit running for several hours; a real concern when using the halogen lights. This is everything everyone said, that is, a very good product. Does not get hot, gives off huge light and is small enough to fit anywhere. The price was right as well. Very light and bright. Easy to use and gets in small places. Love it. Well made, compact & so bright. Perfect for our needs! Works better than I expected. Use to light the room when I paint. Hi, bought 2 lights and made them permanent lights, one for drill press and one for bandsaw..... let there be light and there was light! This is a nice compact bright light. 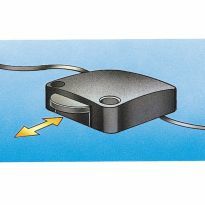 It goes anywhere for spot lighting or can be pointed at a bright surface to get general area lighting. I bought 2. Very nice, compact light. Bright. Five stars if it had a handle. Of the first two I bought, one was bad and the other failed after a few days. Very dim and flickering sometimes . A replacement was sent quickly, and is apparently ok. 2nd replacement supposed to be coming. needed light for bowl hollowing. existing halogen light is too hot. Let there be Light? 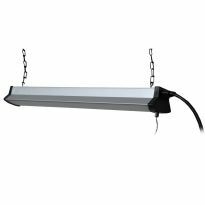 A strong work light is always welcome and this LED fixture looks like it will useful in a number of different nighttime situations. I have one and it is an excellent LED light. Low power usage and stays cool. good for any application.Used it for painting a room in the house. 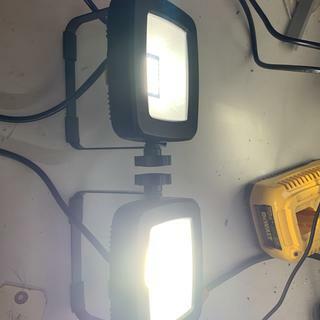 Price and as replacement light source on an existing 2-headed portable worklight stand. Additional lighting for my shop at specific tool locations and to add portability to such lighting. Recent projiehct would have been much easier with this light. Had to hold a flashlight while trying to turn bolts. Replacing an incandescent version that gets way too hot for painting rooms. Reasonable sale price. Also I need light for work projects. Needed a work light.will try it. Always in need of focused lighting at a good price. Operates cooler and draws less power. I have been looking for a way to replace my old ones that have bulbs. I found this online only light and had been looking for a present for my boys. Good deal fair price. Want to switch to LED lights because they run much cooler and last longer. I needed a new work light and wanted to try a LED . 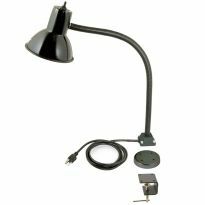 Need small work light to work in cramped quarters. I have a similar light, but I often need a second one or in a second location. used a friends and loved it. I bought 2 as a gift for my husband. I am hoping it will help side-illuminate his projects as he works in a high ceiling warehouse. My basement never seems to have enough light! 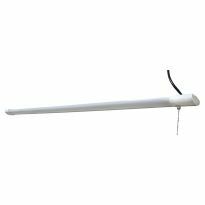 I have been looking at the LED ceiling lamps (and see those as another order, soon) to replace a collection of neon lights; this looks like a nice utility light and will replace the old-single bulb on a hook unit. Price was reasonable. Our last contractor has one and he/we love it. Bought one recently. Liked it so much, I am giving as gifts. It's often dark when I arrive at jobsite and I don't want to sacrifice time waiting for adequate light. To help me install baseboard. 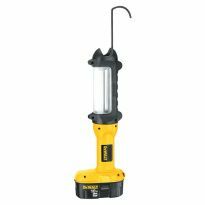 What is the overall size (height, width & depth) of this work light? No dimensions are listed. How is this powered? Is it cord, battery or rechargeable? BEST ANSWER: It runs on 120 volts and has a 5 ft cord. See the Technical Details section. Can someone please give the physical demensions (length, width and height) of this light? Thank you for the information and for taking the time to respond. Can you tell me what the width is without the knobs and stand? As shown in the picture it is about 6" high. It is about 1.5" thick and the plastic cover over the LED lights measures 2.5" X 3.5". It has a 5' cord. Does the work light heat up or stay cool? BEST ANSWER: It stays cool. 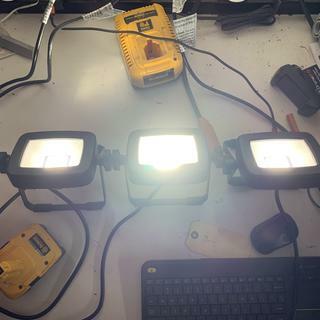 I like the LED work lights because they don't use a lot of power compared to halogen lights, a few watts vs. hundreds, can be places just about anywhere and are bright.. And because of the low wattage you don't need to have a separate circuit breaker just for lights. The light stays fairly cool during operation. It becomes warm to the touch but never so warm that it cannot be handled during use or stored immediately afterward. It seems quite well made with a high quality power cord (fairly short) and good fit and finish. The backside of the light is warm but nowhere near as hot as a halogen light. Overall we are happy with the light. It generates some heat but not enough to burn you when you pick it up while it is on. This light is an LED and does not get hot. The lamp will remain cool. The lens face only gets warm to the touch. It stays cool and is a joy to use. Can the two parts of the stand be collapsed (pulled together) so they're side by side essentially making them one hand hold? If so, can it simply be hung upside down in this configuration? Several reviews mentioned it would be great if it had a handle. I'm thinking of hanging to cast raking light for finishing room. BEST ANSWER: Both handles do come together. There’s a set knob on each side of the handles where they can be adjusted and put together like your wanting to do, or spread apart for free standing. Great. 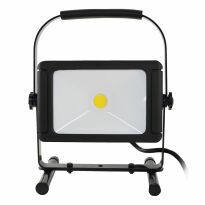 Little light, I’ve used it several times and it will light up a 10x10 room while working in it. Thanks for taking the time to reply. Very helpful. Yes it definitely can be used in that configuration.. in fact that's the way I used it. I made a small wire hook to hang from the ceiling joists and moved it around the basement as I hung the drywall. Hope that's helpful.. Yes. They are designed so one is slightly smaller than the other and thus fits within the larger one, as one single handle, so you should be able to do just what you are stating. Yes, the 2 legs fold into each other so they create the appearance of a single unit. I have hung it that way in temporary situations for exactly that application. Simple answer: Yes the knobs at the sides can be loosened to allow the stand can be folded to make one "handle." Yes, they can be folded together or pivoted to many configurations. I do hang my light by doing that. Yes the two parts of the stand can be together as one hand hold or used to hang the light. Would this light be sufficient to read-by on an outdoor patio after sundown.? BEST ANSWER: Absolutely. Almost too bright for direct view.